In this monthly series, I share a combination of cool data visualizations, useful tools and resources, and other visualization miscellany. The field of data visualization is full of experts who publish insights in books and on blogs, and I’ll be using this series to introduce you to a few of them. You can find previous posts by looking at the Exploring Data Visualization tag. Even though it feels like it was 2016 yesterday, we are more than a quarter of the way through 2019 and the 2020 political cycle is starting to heat up. A common issue in the minds of voters and politicians is fraudulent and rigged elections—voters increasingly wonder if their votes really matter in the current political landscape. Last week, the Supreme Court heard two cases on partisan gerrymandering in North Carolina and Maryland. FiveThirtyEight made an elegant visualization about gerrymandering in North Carolina. 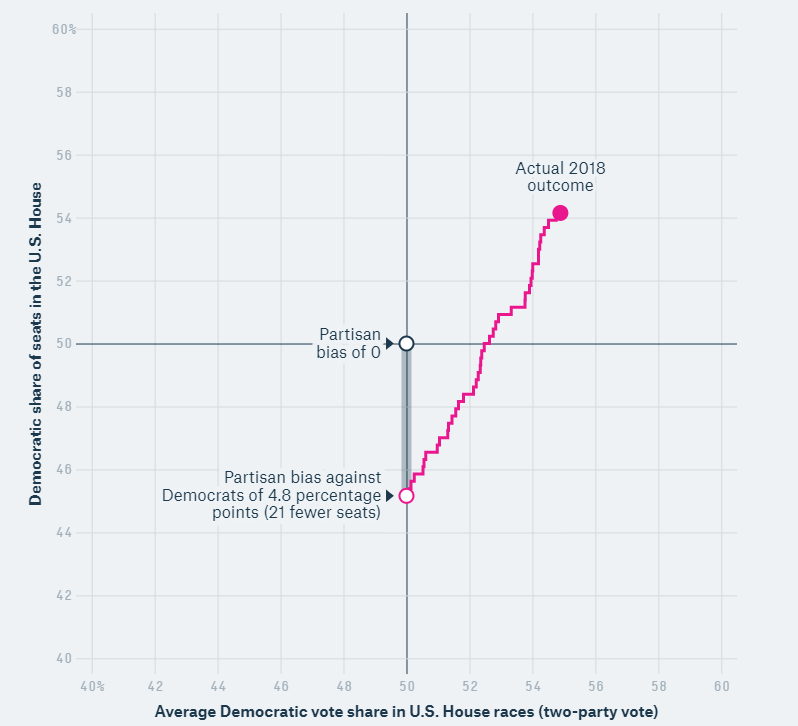 The visualization demonstrates how actual election outcomes can be used to extrapolate what percentage of seats will go to each party. If there is no partisan bias in voting districts, the outcome should be 50/50. As you scroll, the chart continues to develop and become more complicated. It adds results from past elections to contextualize the severity of the current problems with gerrymandering. It also provides an example of the outcomes of a redrawn district map in Pennsylvania. 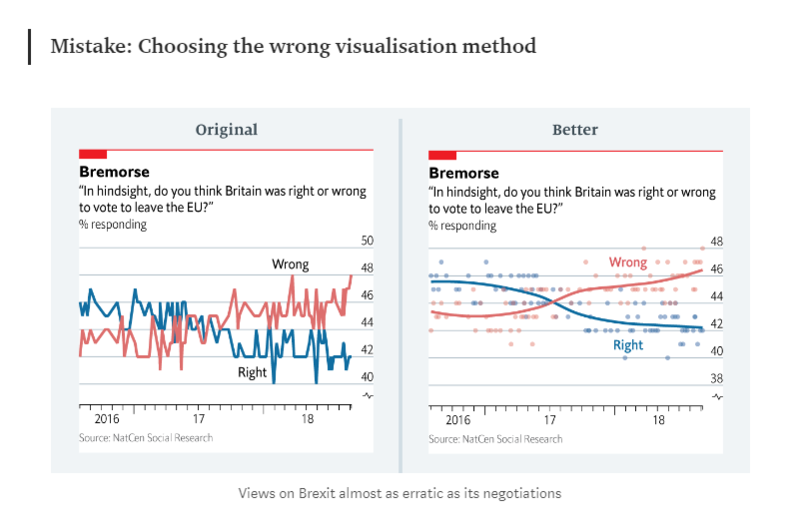 The change from line chart to plotted points better demonstrates the trend of the attitudes toward Brexit. Sarah Leo from The Economist re-creates past visualizations from the publication that were misleading or poorly designed. The blog post calls out the mistakes made very effectively and offers redesigns, when possible. They also make their data available after each visualization. Seeing two visualizations of the same data next to one another really helps drive home how data can be represented differently–and how that causes different impacts upon a reader. The Financial Times has made an online version of their quick chart-making tool available for the public. Appropriately titled FastCharts, the site lets you upload your own data or play around with sample data they have provided. 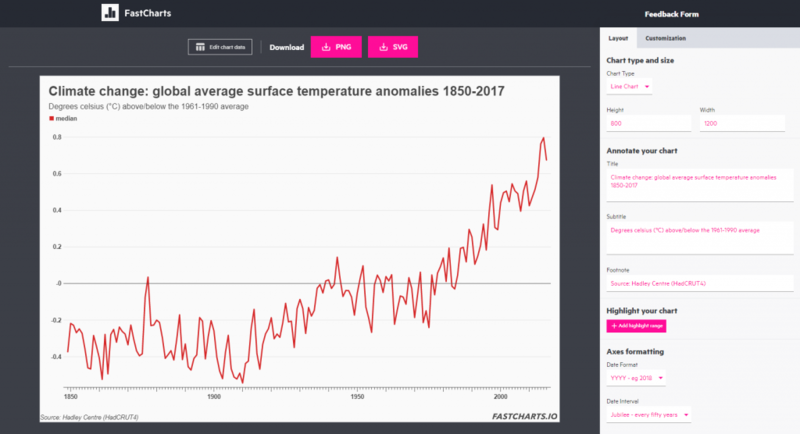 Because this tool is so simple, it seems like it would be useful for exploratory data, but maybe not for creating more complex explanations of your data. FastCharts automatically selects which type of chart it thinks will work best for your data. Play with the provided example data or use your own data to produce an interesting result! For a challenge, see if any of the data in our Numeric Data Library Guide can work for this tool. I hope you enjoyed this data visualization news! If you have any data visualization questions, please feel free to email the Scholarly Commons. This entry was posted in Data Visualization and tagged Data Vis, Data Visualization, exploring data visualization by Xena Becker. Bookmark the permalink.